A teacher or parent need to be alert to observe the whether a child has the fine motor skill or co-ordination difficulties. Early identification and extra help can often prevent failure as the student spends his early years in school. Kids or Adults with well developed Motor Skills produce good handwriting. The child who can't tie his shoes might be the same child who has difficulties with handwriting in class. Hence parents and teachers need to give importance to the development of motor skill during the tender age of the child. 'Having good proximal stability and trunk control supports the emergence of fine motor skills (including handwriting), which are important aids to a child's ability to learn.' says Tara Losquadro Liddle in her book Why Motor skills Matter. We give below some activities and tips to improve the motor skills. Children and adults who have poor handwriting can also try these activities which result in Handwriting Improvement. Moulding and rolling play dough into balls - using the palms of the hands facing each other and with fingers curled slightly towards the palm. Rolling play dough into tiny balls (peas) using only the fingertips. Cutting play dough with a plastic knife or with a pizza wheel by holding the implement in a diagonal volar grasp. Tearing newspaper into strips and then crumpling them into balls. Use to stuff scarecrow or other art creation. Scrunching up 1 sheet of newspaper in one hand. This is a super strength builder. Picking up objects using large tweezers such as those found in the "Bedbugs" game. This can be adapted by picking up Cheerios, small cubes, small marshmallows, pennies, etc., in counting games. Lacing and sewing activities such as stringing beads, Cheerios, macaroni, etc. Using eye droppers to "pick up" colored water for color mixing or to make artistic designs on paper. Playing games with the "puppet fingers" -the thumb, index, and middle fingers. At circle time have each child's puppet fingers tell about what happened over the weekend, or use them in songs and finger plays. When scissors are held correctly, and when they fit a child's hand well, cutting activities will exercise the very same muscles which are needed to manipulate a pencil in a mature tripod grasp. The correct scissor position is with the thumb and middle finger in the handles of the scissors, the index finger on the outside of the handle to stabilise, with fingers four and five curled into the palm. Cutting junk mail, particularly the kind of paper used in magazine subscription cards. 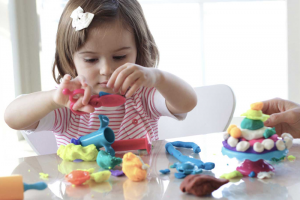 Cutting play dough with scissors. The following activities ought to be done frequently to increase postural muscle strength and endurance. These activities also strengthen the child's awareness of his/her hands. Drawing in a tactile medium such as wet sand, salt, rice, or "goop". Make "goop" by adding water to cornstarch until you have a mixture similar in consistency to toothpaste. The "drag" of this mixture provides feedback to the muscle and joint receptors, thus facilitating visual motor control. Picking out small objects like pegs, beads, coins, etc., from a tray of salt, sand, rice, or putty. Try it with eyes closed too. This helps develop sensory awareness in the hands.
" Writing is the art of mind through words. Let's make it beautiful. "